Three Nutrihair or Florisene tablets per day provide 72 mg of iron, 1.5g of L-lysine, plus other hair growth promoting ingredients including biotin and selenium. Overall, customer reviews seem good. But some have reported a few side effects. This review explains these products in detail to help you decide whether they are the right choice for you. 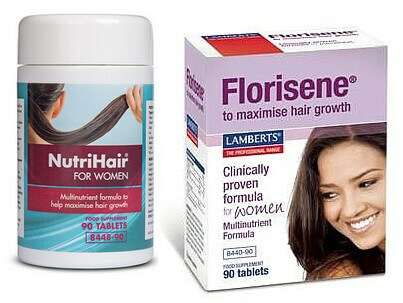 Nutrihair for Women (by Nature’s Best) and Florisene for Women (by Lamberts Healthcare) are essentially the same product made by sister UK companies. Interestingly, the parent company of both Lamberts Healthcare and Nature’s Best is owned by Merck – the company which also makes the hair loss drug Propecia. Both Nutrihair and Florisene are tablets which have the exact same ingredients (iron, vitamin C, vitamin B12, biotin, selenium and L-lysine), at the same dosage and same price. And they’re used to treat the same type of hair loss – chronic telogen effluvium (CTE). This type of hair loss affects millions of women. The reason why it affects so many is because a large number of women can become deficient in the mineral iron. Blood loss from heavy periods, insufficient iron intake (e.g., from a vegetarian diet or consuming very little red meat) – all these things can add up and gradually deplete a woman’s iron reserves. 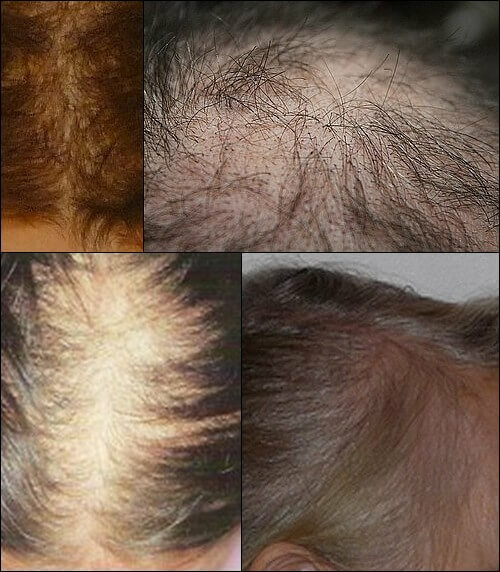 From the photos below, you can see that chronic telogen effluvium develops as heavy thinning of the hair and is evenly distributed throughout the scalp. It’s important to bear in mind that this supplement has been especially designed and promoted for women who have hair loss due to low levels of iron. But that doesn’t necessarily mean that men with low levels of iron who also suffer chronic telogen effluvium would not benefit from Nutrihair as well. I’m sure any man who wants to keep his hair wouldn’t think twice about using a product that has "for Women" in its name if they think (or have been told by a doctor*) that it could help them. * Whilst men can also suffer chronic telogen effluvium, they obviously don’t suffer heavy periods. And for that reason, most men are much less likely to develop this condition than most women, even if they were vegetarians. So, self-diagnosing and then taking iron supplements is not a good idea. Obviously both men and women would need to consult a doctor first to get their iron (ferritin) levels checked, and then ask whether this product is suitable for them. A Good Deal for What It Is? At up to three Nutrihair or Florisene tablets per day, you'll be getting 72 mg of iron and 1.5 grams of L-lysine. If you get either of these products in quantity, each tablet would cost just pennies. 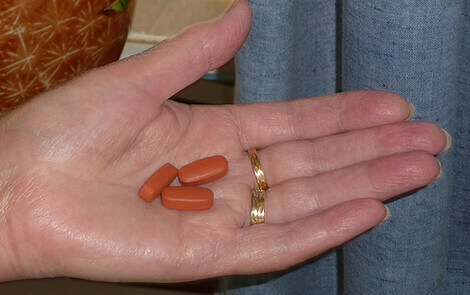 But, at a daily dose of three tablets, you might think adds up to quite a lot for a simple iron supplement. However, you have to bear in mind that there are other beneficial ingredients too (so you're not simply taking iron tablets for hair loss). And, as a hair regrowth product, it’s a pretty good deal providing it works. Do Nutrihair and Florisene Work? As with any other type of hair loss, it’s important to identify and then effectively treat the underlying cause. And, in the case of chronic telogen effluvium, that’s exactly what these products do. As for Nutrihair reviews, given that this product is directed towards women, you won’t be surprised to learn that all the reviews on the official Nature’s Best website have come from women. And virtually all of them are positive with just a few side effects being reported (quite possibly due to the need to take these supplements on an empty stomach to help with absorption of the iron and L-lysine). Note: overdose on iron and you could experience other side effects too such as constipation. So, from the reviews, this product does genuinely seem to help women with chronic telogen effluvium. But would it help men too? Yes, probably. As long as it’s chronic telogen effluvium they need to treat. As for male pattern baldness (which is by far the most common type of hair loss) no, it probably won’t help because it doesn’t treat the underlying cause. To do that, you need to address skull expansion. If you don’t live in the UK, you’ll obviously want to find a product as close to the Nature’s Best Nutrihair (or Florisene) ingredients as you can. And you would also need to make sure that there’s good bioavailability (i.e., how well the nutrients get absorbed by your body). Bioavailability is largely affected by the form it takes, so you need to check that as well as the dose). And, if you do live in the UK but still prefer to look for a different iron supplement instead, then again, you should check to make sure you’re getting all the right nutrients, in the best form, and in the optimum dose. From the mostly positive reviews by Nutrihair users, this does indeed seem to be a high quality product which contains safe ingredients that have been formulated to address a specific nutritional deficiency in iron, and can (in time) successfully treat chroninc telogen effluvium. And, as such, it does get recommended here.